One bid conferences don't always get a lot of love. In college basketball preview magazines such as Athlon, they get a page for the whole conference, as if a small paragraph on each team is enough to encapsulate everything about the team. Among college basketball sites, Yahoo had one of the best previews of the conference, as they devoted two articles to a preview. I know Ken Pomeroy wrote a couple thousands words or so for a preview for College Basketball Prospectus. Blue Ribbon, I must say, does have a solid preview of all of the teams. I don't mean this as a negative at all to the rest of the college basketball sites and writers. I can only imagine that page views for coverage of one bid conferences is minimal compared to writing about the "BCS conferences," so I certainly can't blame anyone for not writing enough about the Big Sky. However, that does not mean they are to be forgotten about, or not looked at in depth. Last year, I wrote a little over 6,000 words in my Big Sky preview, and this year we are a little bit over 9,300 words. If you are looking for a quick look at the conference, it will be best to look elsewhere. My goal is that if you know nothing about the Big Sky, and have never watched a conference game, you will read this article and feel that you know the conference in depth. The first is something I could best describe as comparing a big city to a small city. The big city is exciting. Lots of stars roll through, and you can constantly entertain yourself. In the small city, it is more about the people, the sense of camaraderie, and that everyone is in it together. In major conferences, there are plenty of stars and big names. There is more coverage, more media, more scrutiny. In the Big Sky (and I imagine this is true across all small conferences), everyone knows each other a little more, it seems. I have been in postgame "press conferences" that might have a local newspaper reporter, a reporter for the student paper, and myself. It's impossible not getting to know everyone if you follow the league close enough, and I have found coaches/players/fans that reach out to see if you need anything. I consider myself a pretty lowly blog writer just enjoying myself with a hobby that I love, and I have been touched by the support I have received by everyone associated with the conference. This is one reason why one bid leagues are so great. The second reason is because truly every game matters, and this is something that especially holds true in the Big Sky. While big conferences might put six or eight teams into the NCAA Tournament, everyone going into the year here knows that one team is making the NCAA Tournament, and that is it. Every game in the regular season matters because only seven teams make the conference tournament. If you blow an early game that you should have won, that might mean the difference between seventh and eighth place, which is the difference between having at least a glimmer of hope, and watching at home. If you are near the top of the conference, the top seed means that you will have home court advantage for the conference tournament. You cannot afford to take any games off in the Big Sky. Anyway, that is enough time on the soapbox. Hopefully you enjoy the preview. Let me know any thoughts, or anything I missed, either in the comments or emailing me. You can also find me on twitter, @bigskybball. I always love to hear any thoughts! This has been fluid for the past few weeks, but here is my final predictions for how the conference will play out, with a little tidbit on each team. Damian Lillard is gone, this much we know. He was the Conference Player of the Year and the best PG in the country, which he is proving over and over again with his play at the next level. Just as importantly, he (along with fellow departed players Kyle Bullinger and Darin Mahoney) set the tone for the team and were the leaders. But still, it is reasonable to assume that Lillard's incredible offensive prowess will be the most difficult thing for the Wildcats to replace. No one man could do it alone, and fortunately, no one player will be forced to try. One of the keys will be Scott Bamforth, who will be the starting two guard. If there was any thought that his success was dependent on the attention that Lillard received, a quick perusal of the stats tells a different story. In 2011 (when Lillard had a medical redshirt and played just nine games), Bamforth shot 48.8% from downtown, making 78 threes. Last year, he shot 40.1% from three, making 77 of them. He also posted a bit higher of an assist rate (and TO rate, it should be noted), showing he might be able to handle a little bit more of a ball handling load if need be. 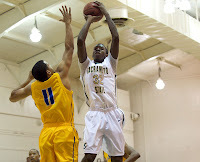 Another guy that will be relied on is Davion Berry, a transfer from Cal-State Monterey. He was a big-time scorer at the DII level, and all accounts say he will be ready to do that for Weber State as well. One of the best parts of Lillard's game last year was his ability to get to the free throw line, and Berry should be able to replicate that, as he led the country in FT attempts two years ago. Weber State is the deepest team in the Big Sky, as they really go a legit two deep at all five positions. It is this depth that I believe will allow them to win the conference regular season title. A) Will Cherry’s injury – He is widely expected to be back by the beginning of conference play, if not a little bit sooner. But I am still worried he might not be at 100% right away when he returns, which could cause the Grizzlies to struggle a little bit early on in conference play. A fully healthy Will Cherry is the best player in the conference, but the difference between Montana and Weber State is not so great that the Grizzlies are a better team if he is not 100%. Maybe he will be right away when he returns for conference play, but I am a little skeptical. B) Departure of Bill Evans – One of the biggest reasons that Montana had been so consistently good is because they always seem to be the best defensive team in the conference. For the past four years, one of the biggest reasons for that was having Bill Evans on the staff, as he was known as being the leader of the defense for Montana. This past offseason, he became the head coach at Idaho State. It is fair to wonder if Montana’s defense might be a little less excellent without Evans on staff as a mastermind. C) Issues in the frontcourt – The Grizzlies were already going to be a little bit thin in the frontcourt after the graduation of Derek Selvig and Art Steward, two key cogs for them last year. One of the main guys expected to replace them was Marko Kovacevic, who looked like he could be their best low-post scorer. However, he was declared academically ineligible, which leaves them without a ton of depth there. Mathias Ward will start at the four, but while he might be the best mid-range shooter in the conference, he is not a great rebounder. Eric Hutchison looks like the starting five, but he has a short track record even though he has been in the program two years. Behind them is Andy Martin (a freshman who had good size but is raw) and Jake Wiley (a supremely athletic guy that is also raw). The X Factor might be Spencer Coleman, who seems to be a more natural three man but could be a smallball four. Among players that ended the year on the team, UNC had one senior and no juniors. They had talented players (they led the country in three-point shooting at 45.1%), but they were young, and they did things that showed that inexperience. In a conference call this preseason, Coach BJ Hill told me that along with their youth came the idea that they would just be able to outscore other teams. Unfortunately, it didn't really work like that. If you could pick two areas that a young team could struggle in, you might say defense, and taking care of the ball. This was where the Bears struggle. If they improve in these areas (and I suspect they will, with the added experience), then they absolutely have the talent to finish number three in the conference. Their turnover % was 24.2, which was number 333 in the country. They had young guards, and they simply were not very good at taking care of the ball. Only one player had a turnover rate under 20%, and that was Tate Unruh, at 18.8. It was a team-wide problem. The good news is that they are a year older and stronger. Defensively, their adjusted efficiency was 112.4 (326th in the nation), and they allowed opponents to shoot 54.0 EFG%, 328th in the country. Also, they didn't force turnovers. While I think their personnel is better suited to improve the turnover issue than defensively, they should see an improvement here. The other reason I am picking them three is because of Derrick Barden, one of the best incoming players in the conference. He is an undersized power forward (which is ok in the Big Sky) who was a third team JUCO All-American last season, as he averaged 20 and 12. He should be able to step in and immediately have a big impact. UND is involved in five of the seven pairings. On the one hand, this is great, because it may mean they have the best home court advantage in the conference, because it will always be a long road trip to Grand Forks (especially in the middle of winter). Last year, North Dakota was 13-1 at home, including a win over Montana (something only Weber State out of the Big Sky was able to do). Of course, this also means that they have the longest road trips in the conference, which will make things very difficult. Brian Jones said they got accustomed to it the past couple years in the Great West, but that doesn't mean it's easy. They went 1-14 in road games last year, including getting beat soundly by Idaho State and Sacramento State. Part of that could be a function of a young team trying to learn how to win on the road, but that has to be an area of major concern for Coach Jones. The other biggest reason (along with the home court advantage) that I have UND fourth is that they return more scoring than anyone else in the Big Sky (chart in the Idaho State section), with Patrick Mitchell their only loss of note. You will be hearing more about Troy Huff later in this article, but he has the talent to be an all-conference in the Big Sky this year. It is my opinion that Coach Jim Hayford has a lot of big days ahead of him, and I think this fifth place projection could be the lowest that EWU is projected to be for awhile. After one year, Hayford's philosophy is simple, and speaks to why I think EWU will have great success. For one, they avoid turnovers. It is one thing for a coach to say that is a key for the team, it is another for a coach to have his team put it into practice so well, which the Eagles did last season. The style is exemplified by Collin Chiverton, who posted a ridiculously low 8.9 TO Rate (12th best in the country), despite taking 38.1% of the shots when he was on the floor (second most in the country). 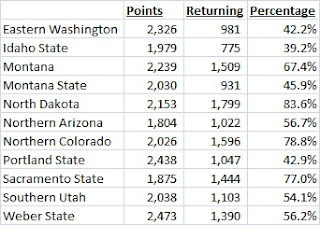 As a team, EWU's rate was 23rd in the country, and I expect that will improve as he gets more of his own guys in there. The Eagles also take lots of threes, and they pretty much have the green light at all times. They shot the third most threes in the country last year, making a respectable 35% from downtown. It is clearly something they look for, and at 35% that is a smart, high percentage way to go about things. Again, it wouldn't surprise me if this number goes up, because you know Hayford is going to look to recruit shooters and place a high emphasis on this. There is a lot of intrigue around his recruiting class, as it features four international players. The early returns I am hearing are very good... in particular, I think big man Venky Jois could be the best freshman in the conference. Point guard Daniel Hill is also a name you will hear a lot over the next four years. They have enough talent to be very competitive this year, but I think they are also set up to be really, really good in the future. I have talked a lot this offseason about how it could be Sacramento State's best team in a long time, so if you are not familiar with the program, you might be confused that I have hyped them up and am now picking them to finish sixth in the conference with a .500 record. You have to know a little bit about their history to know why this would be a very big season. The Hornets have not had a winning record since 1988-89. They return basically five starters, and could have five guys in double figures. After going 0-8 in the first time through conference play, they finished 5-3 in the Big Sky. This is the year for the Hornets to make their move, make the Big Sky tournament, and finish over .500. It has been a long time coming for Hornets fans. - Jamie Stewart was declared ineligible for the second semester last year (he is back on the team this year). - Antonio Biglow was supposed to be a big-time player for them last year, but didn't play at all (he should be a stud for them this year). - Xavier Blount was their best player, but got injured in a bar fight and missed the end of the season (he is back and will be a starter). - Shawn Reid was a key cog for them, but transferred after the year. - Mohamed Fall was told by the NCAA that he had exhausted his eligibility because of exhibition games he played four years ago. - Tre Johnson and Jeff Budinich were arrested in an off-season incident (Johnson was kicked off the team, Budinich had his scholarship revoked). This would be difficult for any team to go through, and has to be especially difficult for Huse, with rumors around that he needs to have a good year in the final year of his contract. They will be strong in the backcourt, with Biglow, Blount, Stewart, and Christian Moon all capable of playing big minutes. They key will be avoiding a second-half slide which has become all too familiar for the Bobcats. The talent is there for this season to be much better than a seventh place finish. Let's see if the Bobcats can put it together all year, because their roster can pose a ton of matchup problems. The big key for them, not only this year but in the future if they want to be a consistent contender in the Big Sky, is defense. Over the past three years, things have been ugly. In 2010, they were 338th in the country in adjusted defensive efficiency (112.4 points allowed per 100 possessions). In 2011, they are 334th in the country in adjusted defensive efficiency (113.8 points allowed per 100 possessions). Last year, they improved... all the way to 313th in adjusted defensive efficiency (110.6 points allowed per 100 possessions). In short, they have been one of the worst defensive teams in the country when looking at the past three seasons. Coach Tyler Geving thinks they will be improved this year with different personnel. Gone is Charles Odum, who was a great scorer but didn't get a lot of stops. Getting minutes in his place is Dre Winston, a transfer from Washington State that Geving says has the chance to be one of the best defenders in the Big Sky. Also in is junior college transfer Marcus Hall, who they say brings a defensive presence. They need to force more turnovers, as they were one of the worst teams in the country at that last season. The bad news is that Chehales Tapscott was the best for them in that category, but he is gone. They have the talent on paper to be in the top half of the conference, so it would not surprise me if they outplayed this number eight ranking. But for the last couple of seasons, they were a good offensive team and a bad defensive team. They still have offensive playmakers, but they should take a step back there, and I'm not sure they're ready to take a big leap forward defensively. After the firing of Mike Adras and the short interim coaching stop for Dave Brown, there was a lack of some talent in Flagstaff. They returned some good seniors (such as Gabe Rogers and Stallon Saldivar), but they had two of their better freshmen transfer away from the program, including James Douglas. Jack Murphy has made headway on that, bringing in some good players that will contribute right away, and he has a great start on next year's class as well. I feel very confident in saying this - he will turn the NAU program around and get them to be a consistent winner. However, one thing that will be interesting to see this year is the weird roster configuration. The Lumberjacks are a bit heavy on impact guards, and light on players that look to be impact players in the frontcourt. It's possible that four of their top five guys will be 6'2'' and under (Rogers, Saldivar, Michael Dunn, and DeWayne Russell), with the fifth guy being 6'6'' Gaellen Bewernick. During the preseason coaches conference call, I asked Coach Murphy about the chances of seeing three of those little guys on the court at the same time. In essence, he said they would do whatever they could to get their best players on the court, including playing three of the little guys at the same time (it would not surprise me if Rogers/Saldivar/Russell all started), or even playing Bewernick at the 5. The Lumberjacks have been ranked anywhere from 9-11 in preseason predictions, and I think that is fair based on their current talent level and difficulty in matching up with some teams. However, they are going to be very entertaining to watch, and I think they are building for a really solid future. Nick Robinson is the youngest coach in the league and one of the youngest coaches in the country. Being that it is his first year at Southern Utah and his first year as head coach, it is tough to tell what style of team he will try and build. Perhaps the best way is to look at what type of player he was, and the coaching style of Trent Johnson (he was under Johnson for three years at Stanford, and the past three years at LSU). As a player, Robinson was a glue guy that did all of the little things the team needed to win. His senior year, he score 8 ppg, and only shot 36% from the field, but he played over 33 minutes per game, because he contributed in a lot of ways. He was a good defender, and chipped in almost five rebounds and two assists per game. He also got 1.5 steals per game with his tough defense. He says he wants to bring a tough, man-to-man style of defense to Southern Utah. The hallmark of Johnson's teams has been tough defense. Other than a 2 year period at LSU where the team struggled (winning 11 games each year), Johnson's teams were 57th or best in defensive efficient every year since 2004, reaching as high as 15th best a couple of times. Offensively, his teams were efficient when they were at their best during the Stanford days. They were frequently towards the bottom in three pointers attempted, but they were often solid at avoiding turnovers. They were generally pretty average in their pace. How does this relate to the future of Thunderbirds basketball? I am guessing Robinson will try to build with defense first. The best teams he has been a part of as an assistant were built starting with defense, and he will try to get players to buy into his system there. Offensively, it is about efficiency, taking care of the ball, and controlling the pace. Looking at this year's roster, they don't have the athletes to push the pace (last year's team was 279 in adjusted tempo). They will rely heavily on Jackson Stevenett, who could average 15+ points per game with sheer efficiency. He doesn't take bad shots, knows his strengths, and plays within a team concept. I am guessing that will be the prototype for Robinson's offense. I like Bill Evans a lot, and think he is a very good coach. His recruiting class this year, and the one started for next year suggest that he is going to improve the talent level here to a step up from past years, where they have had little depth on the roster. However, he is walking into a situation where it will be tough for him to step in and win right away. They lose 3/5 of their starting lineup, and this was not a team that relied a lot on their bench last year. Here is a chart showing the percentage of returning scoring from last year, which shows the Bengals to be at the bottom of the Big Sky. It will be a rebuilding year for the Bengals, since they lost arguably their three best players. There will be a lot of new faces, which will excite ISU fans. Of the five newcomers, two of them started their exhibition game, while the three others were the first ones off the bench. The future of ISU is arguably brighter than it has been anytime in the past few years. However, with their talent level, it is difficult to imagine them rising above ninth place in the conference this year. I have them last, but I think 9 through 11 will be tight. 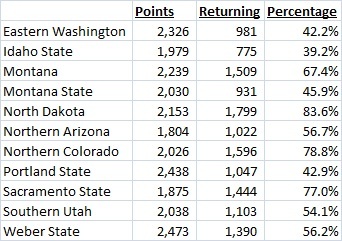 Put it this way... Idaho State is picked last here, and they were mostly picked last heading into last season (though they finished way above that)... but I think they are significantly better than NAU was last year (when they took last). This will be a tough conference, 1 through 11. New Format: In past years, the top 6 teams made the conference tournament, with the one and two seed getting a bye. Number three would play number six on a Saturday, with number four playing number five, both games at the site of the higher seed. The winners would advance to the semifinals against the top two seeds, which was played at the site of the conference champion. The semifinals were played on a Tuesday night, with the championship being the next night. This year, the top seven teams make the tournament, with only the top seed getting a bye. It will feel more tournament-like, as all the games will take place on three days, with the championship coming Saturday. It will be a great tournament. Location: This always brings up debate with fans, the fact that the tournament takes place at the home arena of the regular season champion. It makes it tougher to plan to travel to the tournament, because you might not know where it will be until a week beforehand (last year, the location was determined when Montana beat Weber State on the last day of the regular season). I personally think it is great. A conference like the Big Sky needs to do what they can to make sure that the best team makes the NCAA Tournament, because that provides the conference with the best chance of a good showing. They do there, as the top seed gets home court advantage and a first round bye. It also brings more fans to the championship game and creates a better atmosphere for the conference's showcase game, since that is the one on national TV. All in all, I like it. Montana over Montana State - Last year, the Grizzlies got better as the season went along while the Bobcats got worse. Northern Colorado over Sacramento State - As a young UNC team grows up, their superior talent and depth will take down the veteran Hornets team. Eastern Washington over North Dakota - Both teams will be better next year, but EWU has been through the rigors of the Big Sky tournament before. Weber State over Eastern Washington - The Wildcats will be rested, and their superior depth will be too much for the Eagles to overcome. Montana over Northern Colorado - The Bears were up on Montana in the second half in Greeley last year before falling because of Montana pressure. On a neutral site, I like the Grizzlies. Montana over Weber State - Part of the reason I ranked Weber State over Montana is that I think it will take Will Cherry a little bit of time to get back to being himself, and for the new pieces to gel together, especially in the frontcourt. But by conference tournament time, I think they will be rolling again. Wayne Tinkle adds another accomplishment to his already impressive resume. 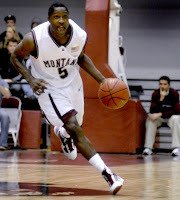 - Kareem Jamar* (Montana) - He is the most complete offensive player in the conference, hands down. He is a good outside shooter (44% threes), has a good post-up game, gets to the FT line, and is one of the best passers in the conference. Add in that he is solid defensively and grabs over 5 boards a game, and he is my pick for POY. - Will Cherry (Montana) - If he was healthy, he would be my POY pick, because he is the best defensive player in the conference, and has improved every year offensively. You just need to look at his three point shooting. His freshman year, he shot 17% and made six of them. His sophomore year, he was up to 23% and made 23 of them. Last year, he made 37% and made 51 of them. During their meetings with WSU last year, he more than held his own against Damian Lillard. - Scott Bamforth (Weber State) - He is a dangerous shooter (and practically automatic from the free throw line), but also a sneakily good ball handler and passer. He will be counted on heavily for production and leadership in the Wildcats backcourt. - Collin Chiverton (Eastern Washington) - I have noted it before, but he had one of the most bizarre stat lines in the country last year. He was second in percentage of shots taken while he was on the floor, but also had one of the lowest turnover rates in the country. He was solid last year while battling a broken foot. This year, completely healthy, he should be extremely explosive. - Renado Parker (Portland State) - This is a bit of a wildcard, because he didn't even start for the Vikings last year, and he is a 6'5'' power forward. But he is the only guy that can challenge Kyle Tresnak for the crown of best post scorer in the conference, and he is a very solid rebounder as well. He shot 57% from the floor last year, and it wasn't a sample size issue. He could average 16 points and 7 rebounds per game this year, his post game is that good. - Kyle Tresnak (Weber State) - The Big Sky is not a conference with a lot of dominant big men, which is why Tresnak has the potential to be one of the best players in the conference. He is a 6'10'' low post scorer, which doesn't come around much here. He has a good baby hook, and can take over games when he is getting the ball. The one thing he doesn't do is rebound much, as he has posted poor rebound rates for a big man. If he can improve in that area, he could be in the running for conference player of the year next season. 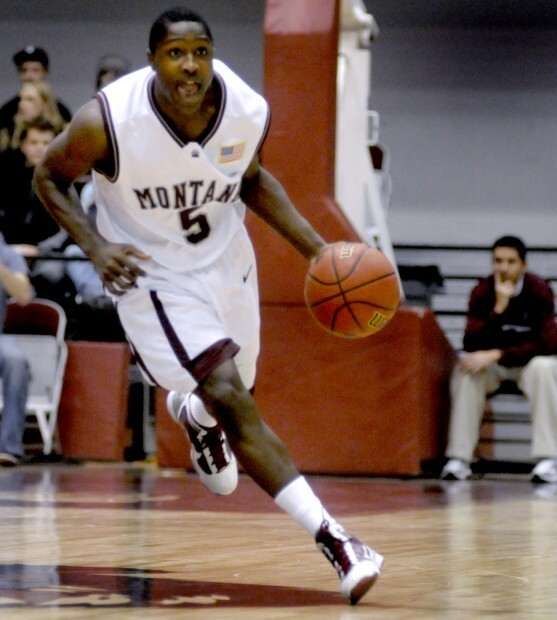 - Antonio Biglow (Montana State) - His debut has been long awaited in Bozeman, and I don't think he will disappoint. He could probably score 20 per game if the team needed it, but MSU will be at their best when he is getting others involved and picking his spots offensively. - Troy Huff (North Dakota) - I looked at him extensively a couple weeks ago, and the cliff's notes version is this: He is one of the most talented players in the Big Sky. If he makes the leap, UND will be a conference title contender. If he doesn't, they won't. His three-point shooting struggled last year. If he improves that (or just improves his shot selection) and improves his FT shooting, he has the ability to be a first teamer. - Davion Berry (Weber State) - Going back to last year, there was talk that Berry was the second best offensive player on the team after Lillard. Now, he gets the chance to prove it. He scored in a variety of ways in Division II, and should have plenty of chances here. It wouldn't be a surprise if he scores 15 per game in an efficient manner. 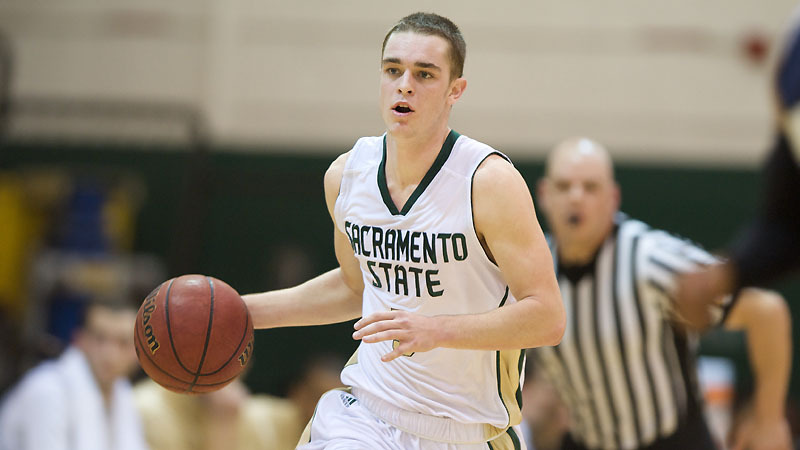 - Joe Eberhard (Sacramento State) - Brian Katz thinks Eberhard should have been the Newcomer of the Year last year, and that is not at all a far-fetched argument. He was a good scorer within the system (54% 2s, 46% 3s, and scored within the flow of the offense. His effective FG% was in the top 50 in the nation. He was a solid rebounder, and grabbed six boards a game. He contributes to them in a lot of ways. - Derrick Barden (Northern Colorado) - BJ Hill is careful not to hype him too much, but I have no such qualms. He is an all-around offensive player, as he is explosive around the basket and has range out to at least 15 feet. He will be a matchup nightmare for four men with his quickness, but is tough enough to out-rebound guys bigger than him. - Gelaun Wheelwright (Weber State) - He is not Damian Lillard, and the onus is not on him to replace Lillard's production, nor should it be. But he is extremely talented in his own way. He might be the fastest player in the conference, and can get out and score in transition. He has a great first step, and that should allow him to get to the basket. If he can improve his jumpshot and make good decisions with the ball, he will be a star. The tools are there. - Dylan Garrity (Sacramento State) - He led the conference in assists as a freshman, and should be an even more complete offensive player as a sophomore. Katz says he is the best shooter on the team, which means he should improve a lot on his 33% three-point shooting. He is already a really good player, and has lots of room for growth. That has to allow Katz to sleep well. - Jackson Stevenett (Southern Utah) - Perhaps more than anyone else in the conference, he knows his game, and he doesn't stray from it. He is solid around the basket, and so he doesn't take many threes. He will be a cornerstone for Nick Robinson in the T-Birds first year in the conference. - Mathias Ward (Montana) - He really came on as the year went along, and is as good of a third option offensively as there is in the conference. He is deadly from the mid-range, and showed that he could be dangerous even from the three-point line. If he can help more on the glass, he can be even better than this. - Konner Veteto (Sacramento State) - The issue with Veteto will be whether or not he can stay on the court, as he has had issues with foul trouble. When he's on the court, he plays like a potential first-teamer. He shot 50% from the floor (while getting to the line a ton), and can lead the conference in rebounding if he is able to play enough minutes. - Justin Crogsile (Eastern Washington) - Jim Hayford's offense places a lot of emphasis on PG production, which could be a good sign for Crogsile as he replaces Cliff Colimon. He was a highly regarded recruit that spent his first two years at St. Joseph's before sitting out last season. I believe in the power of Jim Hayford to turn Crogsile into a very good player for them. - Aaron Anderson (North Dakota) - He was a good player as a freshman, but took a nice leap last season. He shot 48% from downtown, and if he can keep that percentage while taking more (he shot 77 of them last year) he will be an even better offensive weapon. He is not the primary ball handler, but he had a solid 20.3 Assist Rate last season. He brings a lot of things to the table without taking much away. - Tevin Svihovec (Northern Colorado) - He got better and better as the season went along, and could explode as he is just a sophomore. Athletically, he doesn't jump out at you, but he is just solid. He is a good shooter (40% downtown) that doesn't take many bad shots. He is a solid passer, though he needs to get a bit better. If he comes back a little stronger to cut down on turnovers, UNC will have the unquestioned leader of the offense. Last year, as a redshirt freshman, the offense ran through him at the end of ballgames. 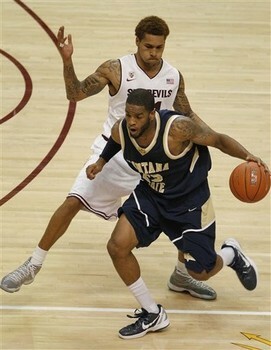 - Xavier Blount (Montana State) - He has the talent to be one of the most varied players in the conference. He was not great shooting outside, but it was good enough that you had to respect his shot. He is a good passer and rebounder for his size. He needs to be more efficient offensively, but hopefully it will help to have Biglow running the offense. - Venky Jois (Eastern Washington) - He is tough to project since he is from Australia, but Hayford said he grabbed 17 rebounds earlier this year in a closed scrimmage. One of the best ways to gauge newcomers is by how effusive the praise from coaches is, and when he signed, Hayford said he had "freakish athleticism and great basketball IQ." He looks ready to start immediately. - Gabe Rogers (Northern Arizona) - If he plays like he did two years ago before he hurt his shoulder, this is far too low for him. If he plays like he did last year when returning, this is too high. I think he will be back closer to the former, where he was an elite shooter and solid scorer. He should do well in Jack Murphy's offense. - Tate Unruh (Northern Colorado) - He might be the most pure shooter in the Big Sky, and his shooting form looks picture perfect. He made 46% of threes and 97% of FTs (38/39) last season. He is a little one-dimensional as a player (though reports are that he has been working hard to change that), but that one dimension is really, really good. - Dre Winston (Portland State) - He scored 26 in their exhibition opener, and Coach Geving said he can be one of the best defensive players in the conference. He was recruited by Washington State and played a season there before transferring, so he has the talent to be really good at this level. They will need him to be a player. - John Dickson (Sacramento State) - He has put up a lot of numbers in career, but did it a lot less efficiently last year than other Hornets. He shot 12% from downtown two years ago (in 39 attempts), and 27% last year (still taking 34 attempts). He needs to cut that out of his game, and the offense will benefit. He has the talent to put up 14 and 6 per game. - Spencer Coleman (Montana) - He will be counted on heavily this year, as he will likely see minutes at both the three and four. He averaged 15 and 7 in junior college last year, and has a nice offensive game that allows him to make threes (56 of them last year) and go down low. His versatility will be extremely important for them. - Melvin Morgan (Idaho State) - Last year, he was the third wheel offensively, and benefited a bit from attention on other guys. This year, he is the most experienced player on the team, and will be called to lead them as a senior PG. He shot just 39% from inside the arc, but 40% outside it. He needs to cut down turnovers and increase assists. He should put up a lot of points for them. - Lateef McMullan (Portland State) - Like Morgan, he was a junior college PG brought in last year, and was not the focal point of any defenses. This year, the pressure will be on him more to step up, because Odum and Tapscott are not here to take care of the ball. He needs to be more efficient with the ball. - Stallon Saldivar (Northern Arizona) -He has never been counted on to score, though Murphy says he will be asked to do that a bit more. 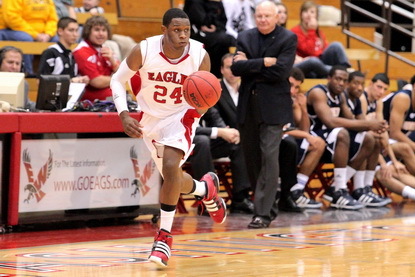 He is one of the best passers in the conference, and had a 32.0 assist rate last year. His turnover rate was also high. They need him to facilitate the offense and make sure everyone knows their role. 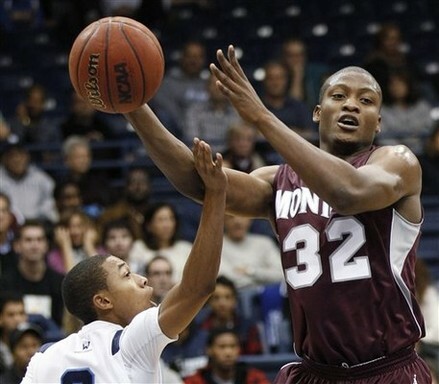 - Flavien Davis (Montana State) - Davis is another undersized big man, as he is 6'5'' but I would guess would see time at the three and four this year. He had similar numbers to Spencer Coleman, with 15 points and 7.6 rebounds per game. He should be a productive player from the get go. - Brandon Brekke (North Dakota) - UND's guards get all the attention, but Brekke has quietly been a really good post player for UND in his first two years. He scores at an extremely efficient rate, as he shot a ridiculous 68% from the field last year. He also snagged 23.4% of defensive rebounds, which is an excellent rate. He has struggled with some foul problems, but he is really good when he is on the court. 1. Davion Berry (Weber State) - See comments above. 2. Antonio Biglow (Montana State) - See comments above. 3. Derrick Barden (Northern Colorado) - See comments above. 4. Venky Jois (Eastern Washington) - See comments above. 5. Justin Crogsile (Eastern Washington) - See comments above. 6. Spencer Coleman (Montana) - See comments above. 7. Dre Winston (Portland State) - See comments above. 8. Flavien Davis (Montana State) - See comments above. 9. 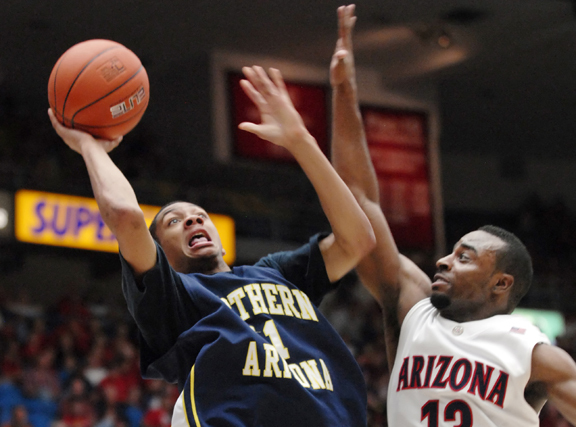 DeWayne Russell (Northern Arizona) - It’s tough to project whether he will be starting or coming off the bench (with the presence of Gabe Rogers and Stallon Saldivar), and how many minutes he will play. But the one thing that seems clear is that he has the ability to be a dynamite scorer. He will have to find his way around the college game a bit, but by conference time he could be the second best scorer on the team behind Rogers. 10. Jaron Nash (North Dakota) - This is still a bit up in the air, as UND coaches are still not sure how the NCAA will rule on the eligibility of Nash, so this is obviously assuming he is able to play (which seems like the fair judgment, but who knows). 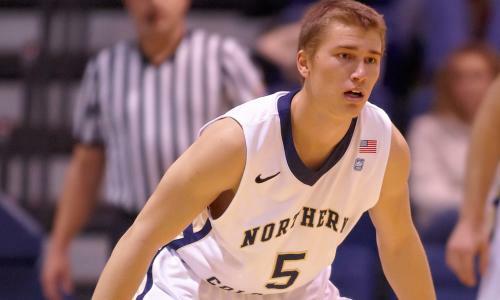 Nash is a transfer from Texas Tech. He didn't play a ton last year, but he is tall and thin with a lot of athletic ability. In his last year before TT, he averaged 11 points and 4.3 rebounds per game. 11. Lamont Prosser (Portland State) - He figures to get a lot of time in a PSU frontcourt that lost a lot of production. I’m not sure if he can have the production that Chehales Tapscott had, or even Renado Parker had last year in his first year, but he will be a good rotation player for them as a capable post scorer and rebounder. 12. Joel Bolomboy (Weber State) - He might be the most athletic guy in the conference at 6’10’’, and has the ability to be a unique talent in the Big Sky. He is a true big man that can run the floor and jump out of the gym, which is rare for the conference. He is a bit raw, but I suspect he could provide plenty of highlight plays this year in the form of big dunks and blocked shots. His impact in the frontcourt could be an x factor for Weber State this year. 13. Chris Hansen (Idaho State) - ISU will be a team looking for offense, and Hansen should be relied on heavily to provide it. It is his first year in the Bengals program, but he is a sophomore sharpshooter. He hit five threes in their exhibition win over Montana Tech, and looks to be given the green light often this year. He is one of many candidates that could lead the league in three-pointers made this season. 14. Tomas Sanchez (Idaho State) - Sanchez is another new guard for the Bengals, but his game is much different than Hansen. He brings a little bit of everything to the table and will likely play many roles for ISU. Last year he shot 44% from downtown, and had a 7:1 assists to turnover ratio. He won’t score as many points as Hansen, but could be a stat sheet stuffer. 15. Mikh McKinney (Sacramento State) - He will be the first man off the bench for Sac State, which makes him very important on a team without a lot of established guys on the bench. He averaged 14 per game as a freshman in junior college, and has reportedly impressed with his explosiveness. He will be vital for the Hornets’ success this year. 16. Paul Egwuonwu (Montana State) - He is not a guy that will put up big numbers, but he is a solid team defender and rebounder, which is what the Bobcats need. He was described by his JUCO coach as a glue guy, and does all of the little things for a team upfront. 17. Thomas Reuter (Eastern Washington) - He is a German import, and should be a solid rebounder and post player right away (Hayford said him and Vois have a chance to be four year starters). He will be an excellent all-around guy for the Eagles. 19. Jordyn Martin (Northern Arizona) - Martin was the first recruit for Jack Murphy, and he will see some time in a frontcourt that is looking for people to step up off the bench. He averaged about 11 and 9 last year as a senior, so you know he gets after it on the glass. 20. Jayson Cheesman (Southern Utah) - He is a true big man at 6'11'', 250 pounds, and should see immediate time. Last year he averaged 8 points/5.5 rebounds/1.4 blocks per game. He is an efficient offensive player that looks to be in line to start or see a lot of minutes off the bench. 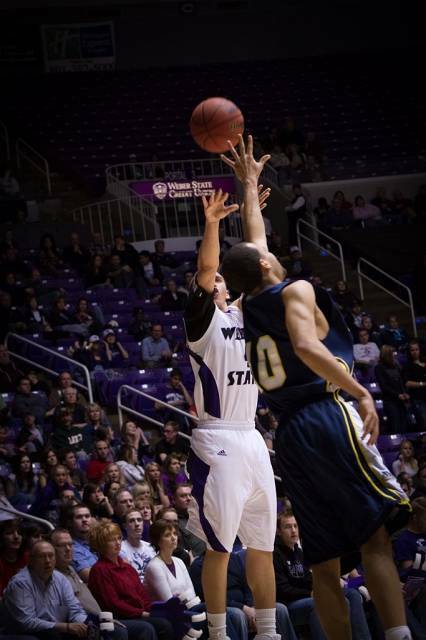 - Kyndahl Hill (Weber State) - Bolomboy’s main challenger for best athlete in the Big Sky could be teammate Kyndahl Hill. He reportedly had a football scholarship to Kansas State, but decided to focus on basketball. He might not make a big splash in year one, and could even be a redshirt candidate, but he has the physical skills to be a really dynamic player in the future. - Daniel Hill (Eastern Washington) - He is not eligible until December, but should still have an impact this year. Even more important, he is the PG of the future for Jim Hayford, and that usually comes with some gaudy numbers. He has gotten a lot of experience in Australia, and Hayford has nothing but great things to say about him. He looks poised for a nice career for the Eagles. 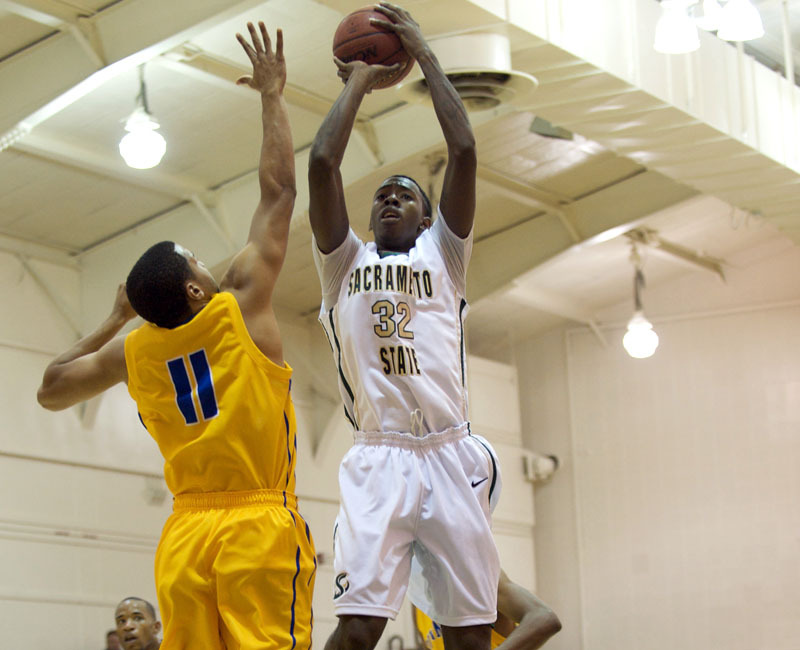 - Cody Demps (Sacramento State) - They love his versatility, as he can play four different positions. He will be counted on a lot this season, but will shine even more with added experience (which will be vital next year and beyond). He was a two sport star in high school, which gives you an indication that he has a lot of athletic ability. - Jake Wiley (Montana) - Wayne Tinkle called him the most athletic post player he has had at Montana in his tenure, but he is just raw right now. He can jump out of the gym, which will make him tough offensively on the break. He also should be able to block some shots. Like Bolomboy at Weber State, he is a guy that is a bit raw to be counted on too much, but he will make some highlight reel plays. 1. Collin Chiverton will lead the Big Sky in scoring -More than anyone else in the Big Sky, he has the green light to shoot at any time. His % of shots was second in the country at 38.1%, and if anything, that could go up, as he took 13 shots in 10 minutes in their exhibition game. He scored 13.9 points per game last year, but that was because he was limited to 22 minutes a game because of a foot injury. He is healthy now, and has range starting just inside the gym, with a ton of athleticism to go along with it. He will have some nights with big scoring numbers this year. 2. Two guys will average seven assists per game -Last year just six players in the NCAA reached this number, but the Big Sky has two players capable of getting there. One is Dylan Garrity, who had 6.9 per game last year, which was seventh in the country and tops among freshmen. The other guy is Stallon Saldivar from Northern Arizona. Two years ago he averaged 5.4 per game. This year, with a faster paced Jack Murphy offense, that number should be even higher. 3. Derrick Barden will lead the conference in rebounding - Last year's leader has graduated, opening the door for someone. I think Derrick Barden, the JUCO transfer for Northern Colorado, could be that guy. He averaged 12 boards a game last year in at Odessa College, and all reports are extremely positive about him. 4. Antonio Biglow will be the second best PG in the Big Sky -Will Cherry is the best PG in the conference and one of the best out west, but Antonio Biglow will be a big-time player. He has a ton of athletic ability and will have a big role for them. In a year where Brad Huse badly needs wins, Biglow will be a cornerstone. 5. Kareem Jamar will lead Montana in points, rebounds, and assists - Last year he was second in points, second in rebounds, and first in assists, so this is not that farfetched. He is a very unique talent, and has the potential to be one of the special players in the history of Montana's program. He can just hurt you in so many different ways on both sides of the floor. 6. Sacramento State will have five players scoring in double figures -Last year they had five guys that averaged 8.1 ppg or more (three in double figures) and all of them return. 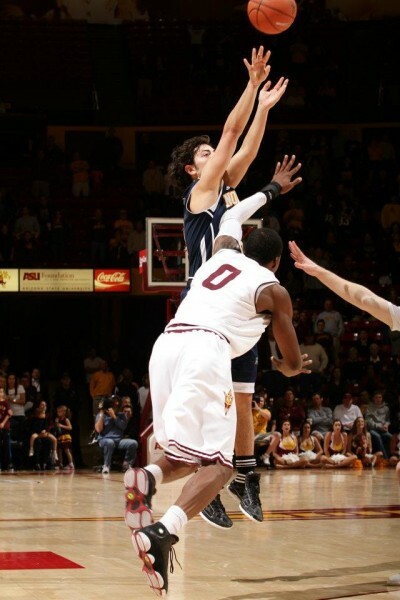 Dylan Garrity was the lowest of the five, and he should be improved shooting the ball. They will be very balanced. 7. Weber State will be the best offensive team -They were second in the conference in adjusted efficiency last year, and I think they could be even better this year even while losing Damian Lillard. They will be balanced, and will be able to have five guys on the floor at all times that can score. Davion Berry is a guy that will be key here. 8. Two teams will have new head coaches next year -I am just playing percentages here... Randy Rahe and Wayne Tinkle have both had overtures in the past couple of years, and it is not a stretch to think that eventually at least one of them will leave. They have proven themselves great coaches at this level. On the flipside, the pressure is on a couple other coaches who are nearing the end of their contracts and need to get it done. 9. Troy Huff and Kareem Jamar will be the best players in the Big Sky heading into next year -We have talked about Jamar, but I think Huff is a guy that will turn a lot of heads this year. Athletically, he has the ability to be a special player in the conference. After a full year in the Big Sky, he should be really ready to breakout for his senior year. - Jeffrey Forbes (Eastern Washington) - After Will Cherry, he may be the second best perimeter defender in the conference. Offensively, he takes things within the flow of the offense, does not force shots, and doesn't turn the ball over much. He doesn't pop out in the stat sheet, but he helps EWU win games. - Eric Hutchison (Montana) - If he doesn’t score a point all year, but just becomes a solid rebounder and low post defender that the Grizzlies can count on every game, he will have done his job. The word is that he has really grabbed the starting 5 spot this year. 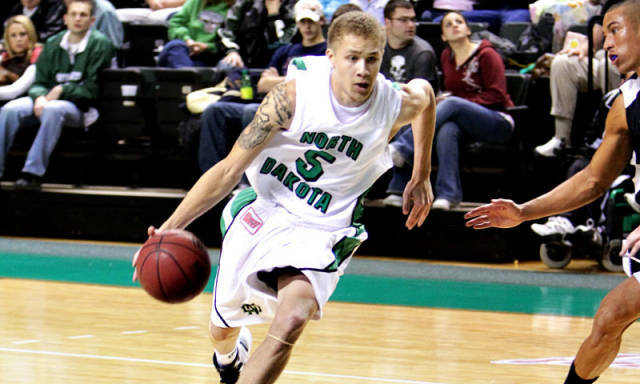 - Brandon Brekke (North Dakota) - He is the not as heralded as some of their guards, but he does the dirty work down low. He is the best rebounder on the team, and takes what is given to him offensively (68% FG). - Gaellen Bewernick (Northern Arizona) -Bewernick is 6'6'', but he played a lot of power forward last year, and will again this year. He is an excellent rebounder and efficient offensive player. Not a lot of people know Bewernick's game, but he is integral to what NAU does. Well, if you made it this far, thanks for reading! Hope you enjoyed! Please get a hold of me via email or twitter if you have any comments, questions, or suggestions! Great work, thanks for all the efforts. Nice work jon. Love the Darin Mahoney award! Excellent! Thank you for taking the time to research and produce such an informative review!